You know, I've been good recently. Despite my new immense fondness for Rock Star fruit punch that I triggered by researching energy drinks for the Nosh Show, I haven't had one in like two weeks... or three weeks, I can't remember, things have been a little blurry busy since then hehehehe. I had very much planned to continue my non-caffeinated journey but then Marvo had to go and post the news about the latest slurpee. I take a few sips and it's not bad. It's not awesome, but it's not bad at all. It's definitely better than a lot of the limited slurpees that just taste like an orange slurpee mixed with something else. I had hoped for a bit more of a fruity vibe, and in a perfect world it would remind me of rock star fruit punch, but this will do in a pinch. Wow, when you mix my questionable caffeine tolerance with my ever churning metabolism, a slurpee like this can really mess with your brain. My mind was going light speed as I chugged this walking back to work, but as soon as I was finished and sat down, I feel like I'm crashing already. I know my metabolism seems quick (it does help me enjoy lots of ice cream), but this is just silly. It's just my imagination right? RIGHT?? 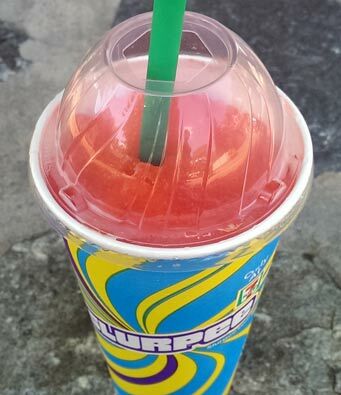 Anyway, I don't know how much longer this slurpee will be out. I believe it's the flavor of the month for September, but considering it's better then most monthly slurpees, I hope it hangs around for awhile. P.S. 4 hours later.... CAFFEINE CRASH!